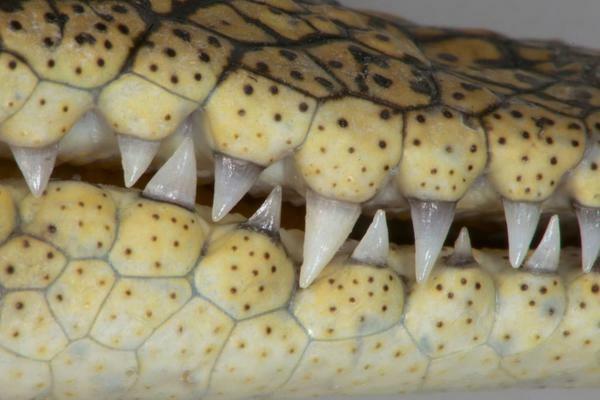 The group of Prof Michel Milinkovitch shows today in the journal EvoDevo that crocodylians possess remarkable multi-sensorial micro-organs with no equivalent in the sensory systems of other vertebrate lineages. During their evolution towards a complete life cycle on land, stem reptiles developed both an impermeable multi-layered keratinized epidermis and protecting scales. Previous studies have demonstrated the mechanosensory abilities of crocodylians due to the presence of small Integumentary Sensory Organs (ISOs) distributed on post-cranial and/or cranial scales. Here, we analyze and compare the structure, innervation, embryonic morphogenesis and sensory functions of post-cranial, cranial, and lingual sensory organs of the Nile crocodile (Crocodylus niloticus) and the spectacled caiman (Caiman crocodilus). Our molecular analyses indicate that sensory neurons of crocodylian ISOs express a large repertoire of transduction channels involved in mechano-, thermo-, and chemo-sensory functions, and our electrophysiological analyses confirm that each ISO exhibits a combined sensitivity to mechanical, thermal and pH stimuli (but not hyper-osmotic salinity), making them remarkable multi-sensorial micro-organs with no equivalent in the sensory systems of other vertebrate lineages. We also show that ISOs all exhibit similar morphologies and modes of development, despite forming at different stages of scale morphogenesis across the body. Conclusion: The ancestral vertebrate diffused sensory system of the skin was transformed in the crocodylian lineage into an array of scattered discrete multi-sensory micro-organs innervated by multiple pools of sensory neurons. This discretization of skin sensory expression sites is unique among vertebrates and allowed crocodylians to develop a highly-armored, but very sensitive, skin.